1896 The Globe Cycle Shop Buffalo, N.Y., with 23 year old “Wheel Truer” George Schuster first on the top row left. As the Industrial Revolution peaked in the US during the late 1800’s, long distance transportation had made great strides. Steam powered ships and locomotives were breaking speed records, and offered a degree of comfort in travel never before seen. However, for most people the horse was still the usual method whether it was going to town for supplies, or for taking longer trips especially in rural America. City residents had a few more options particularly with trolleys, which became the early mass-transit mode for many commuters. There was also the bicycle, which long before the health craze of our generation, served as a reliable means of transportation particularly in cities large enough to have paved streets. Bicycle shops were much like car dealerships today, with every neighborhood having at least one. 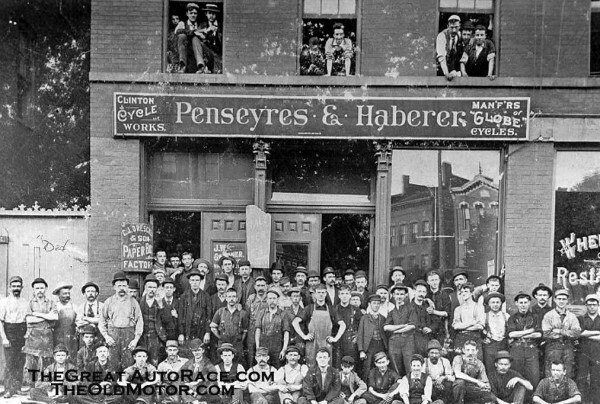 In 1896 Buffalo, N.Y., was no exception with Penseyres & Haberer on Seneca St., proudly representing the Globe Cycle Company. They had in their employ a chap who was considered the best “wheel truer” in the city, as well as an accomplished cycle racer by the name of George Schuster. 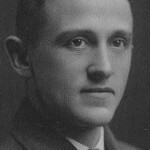 At the age of 23, young Schuster had already built quite a reputation for himself, being selected to participate in the U.S. Postal Service vs. U.S. Army trans-continental bicycle relay race. He won the Silver Creek to Evans, N.Y., leg for the Postal Service, even though he was not a postal employee as no one paid much attention to the eligibility rules. Two years later in 1898, Schuster was cycling with his best friend Albert Johndahl and stopped at an inn to eat. The bar tender beckoned the two young men excitedly whispering “There is a horseless carriage in the barn!” It was a Winton being delivered from the Cleveland factory to a New York City customer by Alexander Winton himself. George had never seen an auto-mobile before, and he was awestruck! That year, Winton sold one of the first cars in America purchased by an individual for $1,000 cash. Thomas built Auto-Tri motor assisted tricycle. Courtesy of: Buffalo Transportation/Pierce Arrow Museum Buffalo, NY. Little did Schuster know, that initial encounter with the horseless carriage would turn into a lifetime of adventure and achievement. Much like the fledgling auto industry, his path would slowly evolve from bicycles to these four wheeled marvels. The E.R. 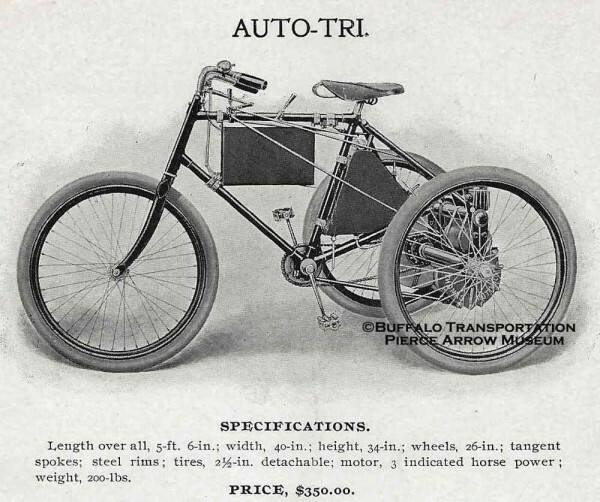 Thomas Motor Company had been building motor assisted bicycles called “Auto-Bi”. It soon evolved into a three wheeled motorcycle dubbed the “Auto-Tri”. 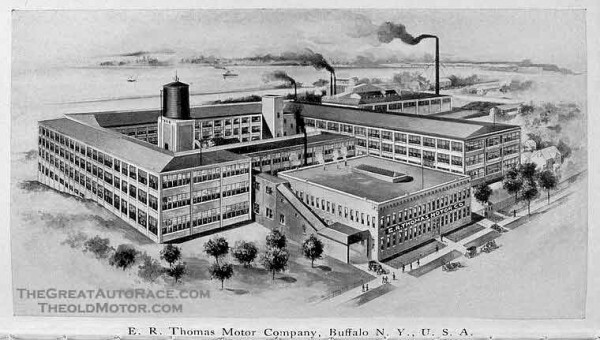 In 1902 Schuster went to work for Thomas at their Niagara St. Buffalo factory, building horizontal under slung radiators for their newly developed one cylinder two passenger automobile. By 1904, three cylinder automobiles capable of seating up to five passengers were available built to order for wealthy clients, and George was now responsible for final assembly. 1904 The E.R. 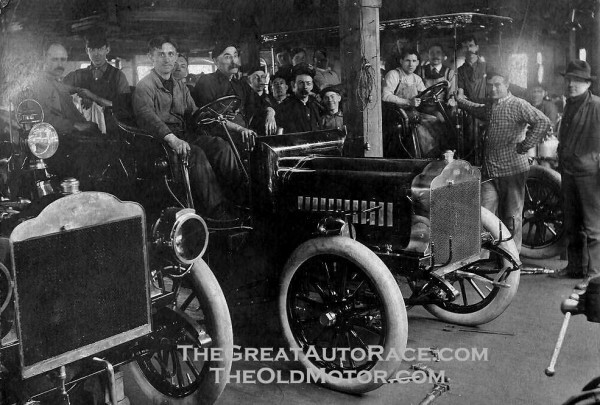 Thomas Motor Company factory on Niagara Street, Buffalo N.Y. With other factory workers, George Schuster is seated in the foreground behind the wheel of a new Thomas. In 1906 Mr. Thomas saw considerable potential in his employee, and asked young Schuster to see what he could do with the Thomas? George made several engine modifications which greatly improved performance. He then drove the modified Thomas from Buffalo to Erie, PA., (93 miles) without shifting from high gear, and to prove it wasn’t a fluke drove it back in the same gear. Mr. Thomas was so impressed, he appointed Schuster the “Chief Trouble Shooter” for the factory! 1908 The E.R. Thomas factory with the central administrative building still standing today as a Historic Landmark. The E.R. Thomas Company grew in size and importance with a reputation as the largest manufacturer of single cylinder air-cooled engines, and in 1905 setting a new record for a summer crossing of the United States in 48 days with the “Auto-Bi” (the motorized bicycle). By 1907, the four cylinder 60 horsepower “Thomas Flyer” was a proven machine. The large sprockets and heavy chain drive to the rear wheels were the perfectly logical method of power transfer for the former bicycle manufacturer. At $4,000 it cost more than the vast majority of homes in America, and was considered one of the most reliable cars of the day. Many wealthy families owned one, even the Roosevelt’s with young FDR learning how to drive an automobile in a 1907 Thomas purchased by his father. By this time, George was delivering Thomas automobiles to international buyers including the President of the Puerto Rican American Tobacco Company in San Juan. Part of the delivery process was to teach chauffeurs (as owners seldom if ever drove themselves) how to maintain and maneuver their new machines. E.R. Thomas was typical of most wealthy owners, although building thousands of automobiles he never learned how to drive one himself. By early 1908 the automobile had entered the scene, but was still considered a passing amusement reserved only for the rich. Certainly not something that would ever replace the truly reliable horse. Part 1 can be seen here and Part 3 can be seen here. By 1908 Thirty five year old George Schuster had seen his first “horseless carriage” at the age of 25, and his life would never be the same. “Great Gramp” lived through the transition of many early manufactures, which evolved from building bicycles at the end of the end of the 19th century into the building of automobiles in the 20th. In 2010, George was inducted into the Automotive Hall of Fame and is now among automotive legends including Ford, Olds, Andretti, and Benz. Copyright 2013 © Jeff Mahl – Great Grandson of George Schuster TheGreatAutoRace.com – All rights reserved. This entry was posted in Auto photos 1885 - 1920, Auto Racing 1894 - 1942, Motorcycle photos, New York to Paris Race and tagged Alexander Winton, E.R. Thomas Motor Company, FDR, George Schuster, Globe Cycle Company, Penseyres & Haberer, Puerto Rican American Tobacco Company, Roosevelt, The Globe Cycle Shop Buffalo, The New York to Paris Great Race of 1908 Part II, Thomas built Auto-Tri, Thomas-Flyer, U.S. Postal Service vs. U.S. Army trans-continental bicycle relay race. Great to hear from you John! I will be sharing a lot of stories I have not told or written about before. The Old Motor is the perfect venue to get into what the world was really like for early motorists. In Part 3, I will be telling about George’s role in the early Glidden Tours!